Telestrations is the award winning, laugh-out-loud party game that has players simultaneously draw what they see, then guess what they saw to reveal hilarious and unpredictable outcomes. In this fun, modern twist on the classic “telephone game,” there are multiple words being passed around between players, with everyone sketchin’ and guessin’ at the same time! But the real fun and laughter is the big reveal, where players get their own books back and get to share how “this” became “that”! Do you remember playing telephone as a kid? You whisper something to the person next to you, they do the same to the person next to them, and so on and so forth. Between you and the end of the line, something would often happen to the message. Sometimes, in fact, what came out the other end barely resembles what you began with. Then there is Pictionary. If, like me, your art skills can only be called “skills” by a very charitable saint, you struggle to draw something, while your team calls out things that have nothing to do with what you are trying to draw. Now, mash the two together, and you have Telestrations. Everything is decent, except the markers. They seem to go dry awful quick in my opinion. So, what do we do? Everyone gets one of the sketch books, markers and cloths. They all write their names on the first page. Deal a card to everyone, and then roll the die. Each card has 6 words on each side. Determine if you are working off of “This Side” or “That Side” and secretly write your word down. If you have an odd amount of players, you will now pass to the left, that person will secretly look at the word you wrote, and draw their interpretation of the word. Should there be an even number of players, then you will do the first drawing. Regardless, whoever drew the first picture passes the pad to the person on the left. The timer will be set, and they have until time runs out to write what they think was drawn on the next page in the sketch book. They pass to the left, the timer is set, and the next person has 60 seconds to draw their interpretation of the word. Play continues in this fashion until the pad returns to the person it started with. Then, the real fun begins, as each player goes through their pad, showing what the word was, what was drawn, and how it changed (or didn’t) change as each person got a hold of it. Hilarity ensues. There is a scoring system, but I never use it. Frankly, the scoring is counter-productive, because I have always found that everyone has a much better time when things went horribly wrong, and everyone starts arguing about why they thought that was what you drew. This is a game that plays best with people who don’t care who wins or loses and who can laugh at themselves along with everyone else. Some of the cards feature a choose your own word, which works great with inside jokes between family and friends as well. I don’t know how many times I have played this game and ended up gasping for breath. I know there are people who would not have fun playing this game, and I am sure you all do as well. However, for those who put aside their ego and their artistic snobbishness and are just looking to have a great time with their friends and family, I think you will find this was money and time well spent. People have been playing the classic game Telephone for years (and likely something similar but differently titled before the invention of the telephone). Telestrations puts a new twist on the game by asking players to draw the word or phrase they’re trying to down the line. By changing the medium of the information from an aural/verbal form to a visual form, the creators of the game have built a system that allows up to 8 of these phrases to be in transit at once. This ramps up the payoff at the end of a round considerably; in Telephone you’d only get one garbled message each time you played, but with Telestrations you’ll get one for each player. The components of the game are adequate; several other reviewers here have commented on how easy it is to build a “DIY” version on your own, and their suggestion is fair, to a point. The flip-book construction of the drawing pads is a fairly key component to how Telestrations is played, and not so easily replicated on a single dry-erase board per player. Overall, the pieces are what they need to be; functional, though not overly fancy. The markers are subject to wearing out, and the boards may gather marks that just won’t go away. Very few players will mind though – these are things you’d expect from the materials at hand, so they’re easy to forgive. My only strong criticism of the game is that it really suffers from the “one weak link” syndrome that all “think-alike” games are prone to. Since each word or phrase is being filtered through every player at the table, having one player who either just lives on a wildly different wavelength from the rest (or who just wants to spoil things in general) can completely kneecap the experience. It only takes one pre-teen who decides that “Meatball” isn’t as much fun a secret word as changing it mid-stream to “The Invention of Hugo Cabret” would be to have everyone at the table left puzzled and deflated by the end. The real joy of the game comes from seeing the subtle misunderstandings in the process of passing the messages at the end of a round. You may find that a player who tries too hard to have fun for themselves will ruin the fun for everyone else. All in all, Telestrations is a great casual/family/party game with no losers (only mostly-winners) that should keep your group entertained for quite a while. This is a structured version of a game that goes by many many names. Essentially, you’re drawing a clue, and then someone’s trying to guess what you were drawing. It gets translated to and from that a bunch of times, and then you see how far you’ve strayed from the original. You can even play it with the game in place if you want, where points are awarded for getting it right between drawings. So accuracy counts. Or at least a proper representation that someone else can guess. This is dressing up the core game, but it’s a good job of dressing up a basic game. It includes a lot of good ideas, so you don’t have to come up with them yourselves, and don’t have to deal with people unable to fold things correctly. The sand timer is pretty good quality as well. So really, I’ve seen this on sale a bunch, and it can make it an excellent entry level game for non gamer people of any age that can read. This is a fun and fast game that all types should enjoy. It is like a combination of the old “telephone game” and pictionary. The after dark version is great for adults but my friends don’t really need the extra push in that direction. In a nutshell you draw a picture and pass your book and the next person writes what they see and passes it and the next person draws what they have written. The whole time you are getting other people’s passed to you so there is little down time. We like the cold reveal with commentary (light heart non-mean commentary). In other words without previewing we say “My word was “cat” and here mom draw an excellent cat sitting in a window. Dad wrote “Cat Nap”. Bob drew a bed covered in cats and Sue wrote Crazy cat lady”. The best part is the crappier the drawer the more laughs they normally get. Great game, loads of fun, and super easy to pick up. Everyone has doodled before and most can pull off a stick figure. With the ones that can’t draw, it just makes the game that more fun when trying to solve the enigma which is there so called masterpiece. Played this game plenty of times at my parties and its a hit every time. Only problem is that they will get loud. So much laughter ahead so beware! I recently played this game and I haven’t had that much fun in ages! 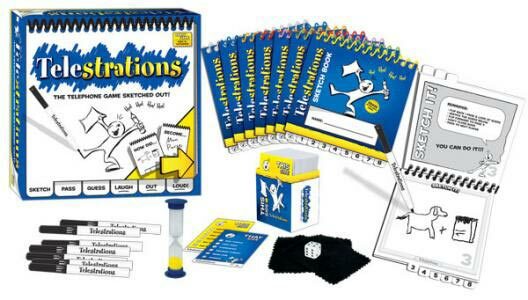 Think combination between the old camp fire game, telephone, and Pictionary and you have the perfect description of Telestrations. It’s amazing how quickly drawings can cause a word or phrase to get warped and it is absolutely hilarious to see that process happening. For example, in one of our rounds, the original word was, “Leopard.” By the end of the round the word had been changed to the phrase, “Cat tree” and finally to “cat stuck in a tree. And the drawings that accompanied it were hilarious. The game, as it comes, is fun and easy for all family members. However, it can be made more “adult” by thinking up your own original words and phrases or by combining it with the cards from Cards Against Humanity! We play this mostly at family functions, people are always asking if we brought it and are eager to play. We’ve included kids as young as 8, who are able to read simple words and spell to some degree. I get a kick out of watching my wife’s family play because they always seem to start laughing and not being able to stop for the entire game. As others have said, if you can play this game and not have a blast I don’t know what’s wrong with you. I usually try to mess with things a bit and make them corny just to get people going. I would suggest you play it with 4 or more people as that gives a word enough time to get really screwed up. Other than that, you’d probably want to invest in an additional set of dry erase markers (we bought an 8 pack of colored expo markers) since the ones that come with the game don’t last that long. Although it’s easy to play this game with your own paper and pens, I find that this game does a great job of helping people that have not played before. On every page, it will say “Sketch It” or “Guess It”, which is especially handy with a slightly inebriated group. This game has been a hit at many parties and family gatherings, so I almost always have it in my traveling bag of games. My only slight beef with the game is that some of the dry-erase markers that came packaged with the game were bone-dry, so we substituted Crayola Markers until I could go out and pick up some more markers. Awesome game, however… My friend saw this game and decided she didn’t want to shell out the 30 bucks when she could go to the dollar store and get 8 dry-erase boards at a buck a pop and basically play the same game. Not to detract away from the game’s fun itself, I have a blast when playing, but I can’t see paying that much for it. Now, granted you aren’t getting EVERYTHING getting only the dry erase boards as listed above, but you could easily substitute matching Cards Against Humanity to start instead of the “This Side/That Side” and the egg timer and dice are easily found in other games if you feel you REALLY need them, but you’ll have plenty of laughs with the whiteboards alone. 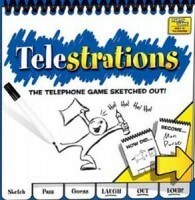 Add a Review for "Telestrations"